The garden of the Manse at Glamis. 8' 9" high, 5'6'' wide. Upright rectangular cross slab, tapering, with a pediment at the top. 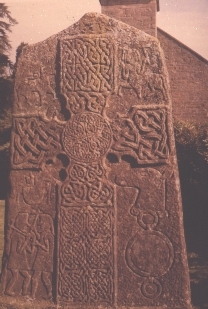 Front: Cross divided into five panels, each containing interlace or interlaced serpents. The background of the cross depicts, in four panels, from the top left hand side: a beast with tail curling back; left hand side, top of shaft depicts two figures in a cauldron (legs protruding) below this are two figures with axes; right hand side shows a centaur with an axe in each hand; right hand side, at top of cross shaft, a beast head, with a circular disc symbol. Stuart, J., The Sculptured Stones of Scotland 1st, Spalding Club, Aberdeen and Edinburgh (1856-1867) Plate 84. Volume 1Stone, Sculpture, Scotland, History, Archaeology.